The country's second-largest school district could see a mass exodus of teachers Thursday when the Los Angeles teachers' union goes on strike. (CNN) - The country's second-biggest school district could see a mass exodus of teachers Monday when the Los Angeles teachers' union goes on strike. Years of frustration over class sizes, salaries and a shortage of school counselors and nurses have boiled over for more than 30,000 members of United Teachers Los Angeles. The Los Angeles Unified School District has made offers to try to prevent the walkout, but the teachers' union said they're not enough. So unless the warring sides find a solution fast, LA teachers will go on strike for the first time in 30 years. "We want an agreement that works for our kids -- that gets to a place where we're not dealing with 50 kids in a classroom, where we're not dealing with 40% of our schools having a nurse for only one day a week," said Alex Caputo-Pearl, president of the UTLA union. Despite the expected absences of 32,000 teachers and staff members, classes will continue at all schools. About 600,000 students could be taught by more than 2,000 reassigned administrators and about 400 substitute teachers, the school district said. Exactly how that would work out logistically remains uncertain. "It's case by case, school by school," said Shannon Haber, chief communications officer for LAUSD. "We're going to have to troubleshoot on the day of." While the teachers' union acknowledged the impact of the upcoming strike on thousands of families, UTLA also invited families to join them on the picket lines. "While every family will make their own decision on whether to send their child to school in the event of a strike, having many parents and allies on picket lines will be powerful and transformative," the union said. Both the union and school district say they want smaller class sizes, bigger teacher salaries and more counselors and nurses in the district's roughly 1,000 schools. The big debate revolves around how to fund them. Union members say they want LAUSD to pull from its $1.86 billion in reserves to increase school staffing and to boost teachers' salaries by 6.5%. "We have been in negotiations with LAUSD since April 2017. 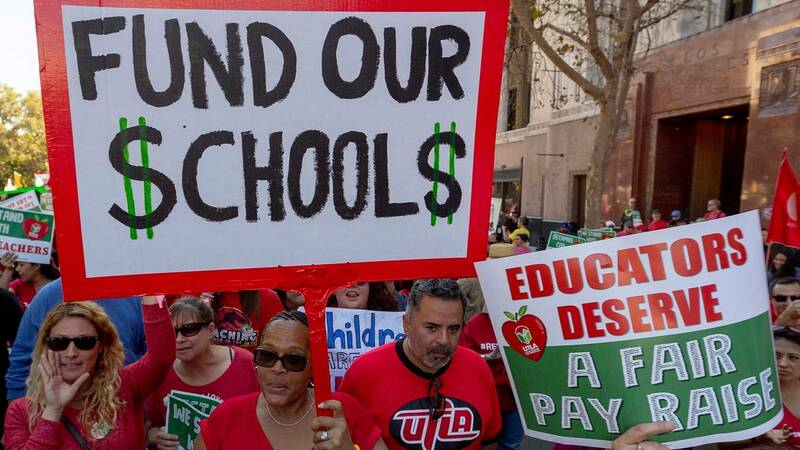 We have been working without a contract for almost one year," UTLA said in a statement. "Even with $1.86 billion in reserves, LAUSD says it does not have the money to improve our schools." But the school district says its pockets aren't nearly as deep as the teachers' union suggests. "When the new school year begins in July 2019, Los Angeles Unified will have about $800 million of the reserve left: $500 million of the $1.8 billion is already earmarked for federal and state-required programs. ... An additional $500 million is being used for a 6% pay raise for all employees, including teachers; to pay for additional nurses, counselors and librarians, and to improve class size," LAUSD said. "Because of the budget shortfall, the remaining $800 million will be completely depleted by the 2021-2022 school year." The situation is so bad, the Los Angeles County Office of Education is stepping in. On Wednesday, the agency assigned a team of fiscal experts to work with the school district on a plan to "eliminate deficit spending and restore required financial reserve levels." The county agency said LAUSD has "failed to adequately address" its deficit spending and is now projecting "higher than expected salary expenses." How can the school district get more money? With the strike looming, school board members ordered Superintendent Austin Beutner to come up with a three-year "enterprise plan" to bring in more money. "Their resolution sets a March 18 deadline for creating a plan that could include parcel tax and school bond measures, as well as strategies for increasing enrollment," the school board said Tuesday. Board member Scott M. Schmerelson said the emphasis should be on making more, not spending less. "We cannot adequately provide for the needs of our children by simply cutting services and programs," he said. So on Wednesday, the superintendent and school board president met with state leaders in Sacramento to try to get more funding. "We are working hard to avert a strike," Beutner said. What are both sides willing to give up? The school district and the teachers' union both made concessions this week in hopes of reaching a resolution. The teachers' union withdrew six of its demands, including limiting standardized testing. The school district offered an additional $75 million to help decrease class sizes and hire more teachers, counselors, nurses and librarians. But those talks Monday ended in another stalemate. Both sides hit the negotiating table again Wednesday, but no deal was reached, Caputo-Pearl said. So the school district and union are set to meet one more time Friday to try to prevent Monday's strike. Evelyn Alemán was a Los Angeles teacher's assistant during the last strike in 1989. She said she remembers the strike's impact on low-income families and students who didn't have their teachers for nine days. "We felt like the odds were already stacked against the kids in the community so high," Alemán said. "Why couldn't the grownups in the room come up with a solution without coming to that?" Fast forward 30 years, and Alemán is now the mother of a 14-year-old Los Angeles high school student. Like many parents, Alemán said she's conflicted about the strike. "I feel like parents are caught in the middle of these two big forces that are in charge of looking out for our children," she said. But as far as the planned strike goes, "I don't agree with the way it's taking place right now." Alemán said she'll definitely send her daughter to school Thursday, even if she's taught by someone other than her normal teachers. "I think most parents are trying to figure out if and whether to send their children to school on Thursday," she said. "It's a toss-up. For those parents who have children who have special needs, in special education, they're just not sure if the folks who are taking care of them that day will be able to support the needs of their children." Will we see another wave of teacher strikes? What's happening in Los Angeles resembles the widespread frustration that led to a flurry of teachers' strikes across the country last year. And while the LA walkout would be the first major teachers' strike of 2019, it certainly might not be the last. "I think what you're seeing is people want to make conditions better for children and for themselves," said Randi Weingarten, president of the American Federation of Teachers. "People have tried to talk to legislators or talk to their bosses ... they've gotten dismissed or disparaged," she said. "A strike is not a first resort for anyone. It's a last resort -- especially for teachers who are asked to do more with less every day. And enough is enough."